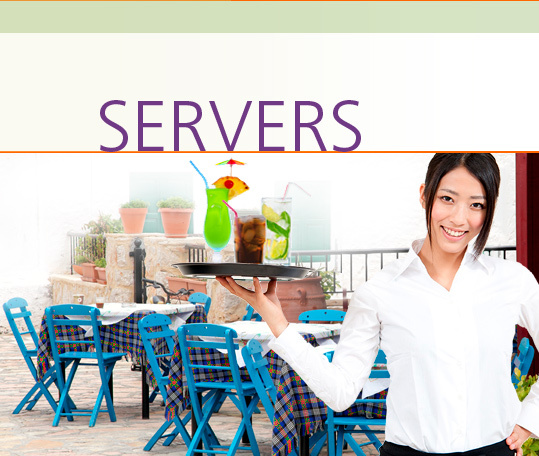 A Server is responsible for taking orders for food and beverages and serving them to guests. They clear tables and provide all the necessary dishes, glassware and tableware needed. Servers work in restaurants, hotels, dining rooms and banquet halls, as well as in bars and coffee shops. In the Servers Career Extension, students learn how to interview for a job and discuss their education, training and work experience. They learn about job responsibilities and work conditions, and discuss company guidelines, policies and procedures. They discuss work procedures, and learn how to greet customers, make recommendations, take food orders, provide dietary information and talk about the daily specials. They learn how to deal with feedback from both clients and superiors and talk about their strengths, weaknesses and goals for the future.